This map displays territory of Russia. 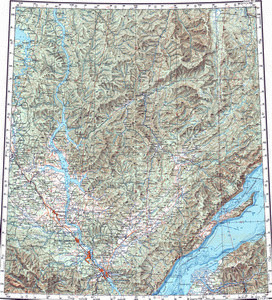 On this map large city Irkutsk marked. city Angarsk download for free. On this map city Usol'ye-Sibirskoye download for free. Displayed city Cheremkhovo download for free. On this map city Shelekhov free download. city Sayansk for Garmin. Displayed city Zima presented. On this map town Svirsk presented. On this map town Ust'-Ordynskiy download for free. You can find here town Zalari for Garmin. On this map town Meget download for free. You can find here town Kachug free download. town Mishelevka free download. On this map town Turuntayevo for Garmin. town Kabansk presented. You can find here town Kutulik for Garmin. Displayed town Bokhan free download.